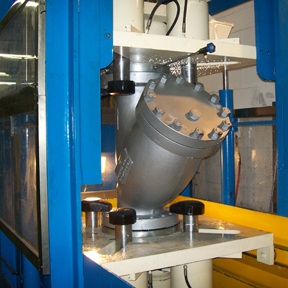 Titan Flow Control is rapidly expanding its factory’s capabilities! 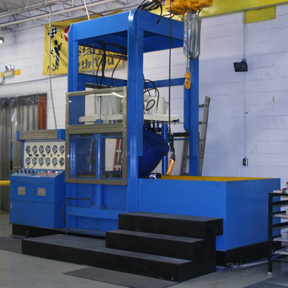 One of Titan’s most recent investments was for new equipment to improve its in-house testing capabilities. Titan’s new hydrostatic tester is huge, standing about 15 feet tall! Previously, Titan could only test its products in sizes up to 14” at its factory and had to rely on external testing for larger-sized products. 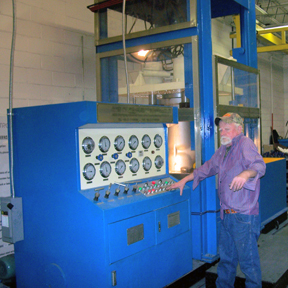 Now, Titan’s brand new hydrostatic tester, standing about 15ft tall, can easily be set to test valves and strainers with a face-to-face of 60” or less and a diameter of 3 feet or less. This will include almost all of Titan’s products sizes 12” to 24” so that Titan can ensure they are leak-free! The adjustable tables, along with the jib crane Titan has installed, makes maneuvering the large products as simple as pushing a few buttons. 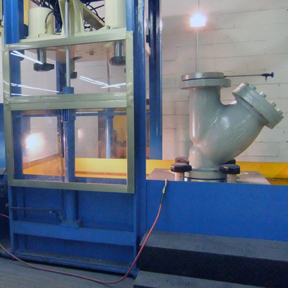 Products with a face-to-face of up to 60” can now be hydrostatically tested in-house at Titan’s factory.